It’s difficult to recommend a generalized first aid kit for everyone because different people do different activities and have different risks. There are a few must-haves though, and then I’ll go into how to personalize yours to meet specific needs. 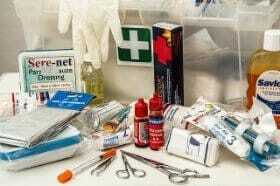 The critical items treat injuries that will most likely kill you or cause permanent damage if left untreated. Chest seals, israeli bandages, and hemostatic gauze are the core items that every first aid kit needs to be built around. 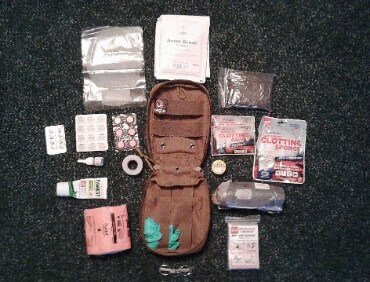 If you have nothing else in your kit, have these items. SAM splints treat severe injuries, but usually they are only life-threatening while you're away from civilization and ambulance services. You may wonder why tourniquets aren’t listed. In my opinion tourniquets fall into a special category because even though they can save your life, they can also be completely useless. A tourniquet is for injuries that bleed so bad they can’t be controlled by pressure, bandages, elevating the limb, etc. When you get this kind of injury you can bleed out in less than 1 minute. Ideally you’d want to be able to take the tourniquet out and apply it in <30 seconds. If it takes you over 30 seconds to realize there is an injury, get to your patient, open your bag, and find the tourniquet, it’s probably too late. If the injury isn’t quite that bad it can probably be stopped just fine using pressure combined with Quikclot and an Israeli bandage. Also, tourniquets only treat bleeding on your arms and legs, not on your torso, neck, or head. I do cover tourniquets completely here. The common items are for daily issues that most people see in regular life. You may not need all of these because some of the uses overlap, but each has its own benefits. Both Benadryl and Bonine help motion sickness, but Bonine is less drowsy and Benedryl is more for allergies. Aspirin and Ibuprofen both reduce fever, pain, and inflammation, but they have different contraindications. You may wonder why band-aids and butterfly stitches aren’t listed. A few band-aids won’t hurt, but in my opinion band-aids are less useful than medical tape with gauze because the cuts they treat are very small and stop bleeding quickly on their own. 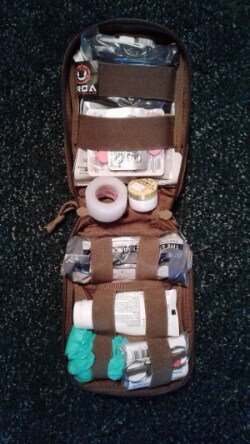 In this first aid kit I replace butterfly stitches and band-aids with Vetbond skin glue because Vetbond does everything they do; plus it stops bleeding instantly. Butterfly stitches can be used to complement Vetbond and take the pressure off where the skin pulls tight across the cut like on knuckles and knees. The optional items are most useful in certain situations but may not be useful for everyone. Triangular bandages, Ivarest, and mylar blankets are best for people who hike or camp a lot. CPR or mouth-to-mouth resuscitation can be performed as compressions-only or mouth-to-mouth in an emergency, so a CPR mask isn't strictly necessary for a normal first aid kit. You may want an N95 mask if you’re likely to encounter TB or spend a lot of time breathing air pollution. A tourniquet works great if you’re willing to have it ready at all times. ACE bandages and cold packs are useful if you play sports or hike a lot. An antidiarrheal is often good for frequent travelers who are exposed to new diets often. An AED is useful in high traffic areas or for people at high risk of sudden cardiac arrest. AEDs are extremely easy to use, and have step-by-step, usually spoken as well as written and pictographic, instructions on what to do. You do not have to be medically trained to buy an AED. Those who have coronary heart disease and the elderly are most likely to need one.